Want a Special Valentine’s Day Song? It should be ready for Valentine’s Day. This may seem like an unusual question and I’m about to explain what it all means and how you could have a simple song to sing to your valentine very soon! As you know the big day for lovers is coming up and my son and I were talking and one thing led to another and before you know it we were creating the lyrics and music. It’s short, catchy and easy to remember and sing. In another life, I was the lead singer in a band and I wrote music for fun. My son and I are going to launch our own song for Valentine’s Day. So if you would like something special, novel and new for the one you love, our song will be something you can whistle or sing to your valentine. We will most likely do our own versions, so you can please yourself as to which one you want to sing to your valentine. We will give you access to the performance, the video and the lyrics. It will be downloaded as a custom magazine to open on your iPhone or iPad. You can quickly learn the song and be ready for Valentine’s Day. “My Valentine” – your song for Valentine’s Day. We are doing something special for subscribers to Paid To Think Business Magazine! For a short time subscribers will get access to their own custom edition. Would you like to promote your brand? Would you like to build grow your audience and build your subscriber’s list? Would you like a new channel for your products and services? 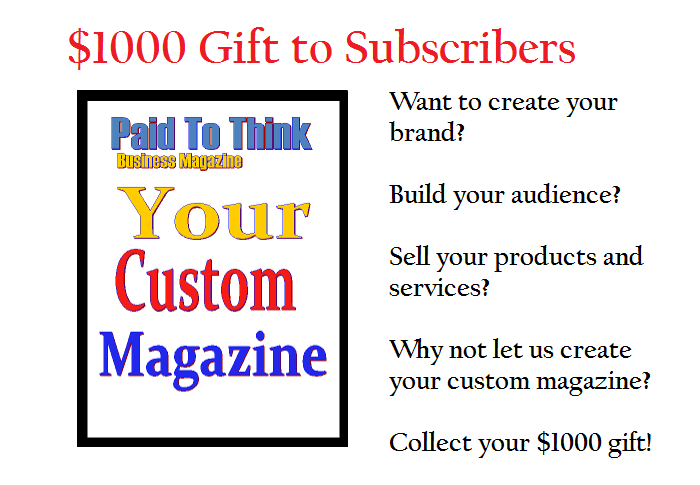 Would you like to collect a free custom magazine issue? Grab Your Custom Issue While this offer lasts! Are You an Expert? You May Be Eligible For a $1000 Marketing Gift! We will create a special magazine issue to showcase your business and sell your products and services. To get started visit our magazine and become one of our paid subscribers! This special bonus may disappear at any time. Go now and get your custom edition!